After activation of the plugin go to wp-admin ->Settings->Mashshare LikeAfterShare and specify your settings. Most important field is APP ID which needs a properly configured Facebook APP. Otherwise LikeAfterShare will not work. You find the link to the Facebook APP account within your LikeAfterShare settings. Go to your app settings in https://developers.facebook.com/apps click the advanced settings tab and check to see if your APP is in sandbox mode. After doing some changes on the facebook app ID settings page it sometimes happens that the ID is chaning. 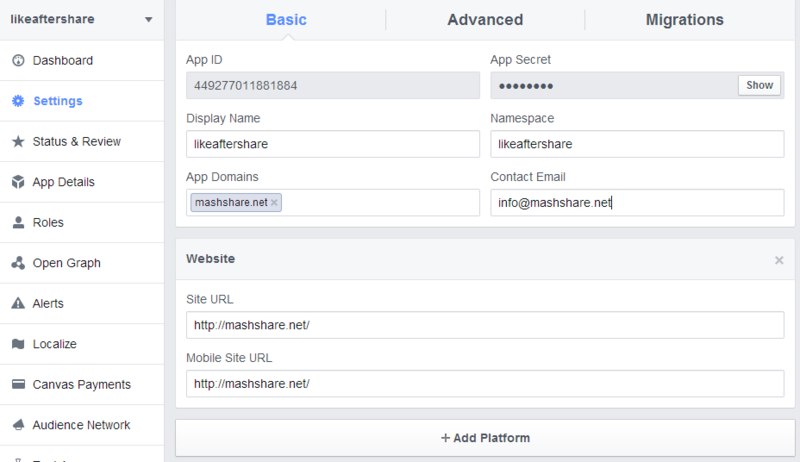 Make sure that the APP ID is still the correct one in MashShare LikeAfter Share settings. If you are unsure just copy and paste the number again.